1University Mohamed V-Agdal Faculty of Sciences, UFR Informatics and Telecommunication B.P. 1014 Rabat, Maroc. 2Faculty Ain Chok ,UFR Signal Processing ,University Hassan II, B.P. 5366 Casablanca, Maroc. Modul D5, C/ Jordi Girona 1-3, Espagne. 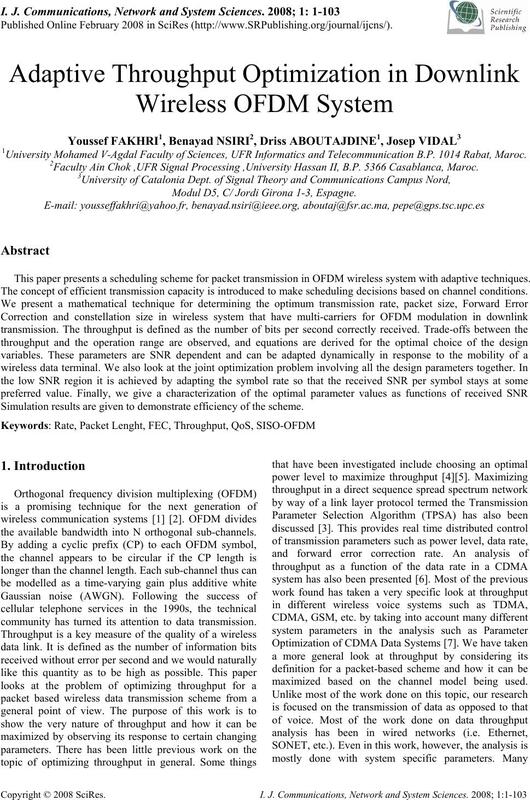 This paper presents a scheduling scheme for packet transmission in OFDM wireless system with adaptive techniques. The concept of efficient transmission capacity is introduced to make scheduling decisions based on channel conditions. Simulation results are given to demonstrate efficiency of the scheme. 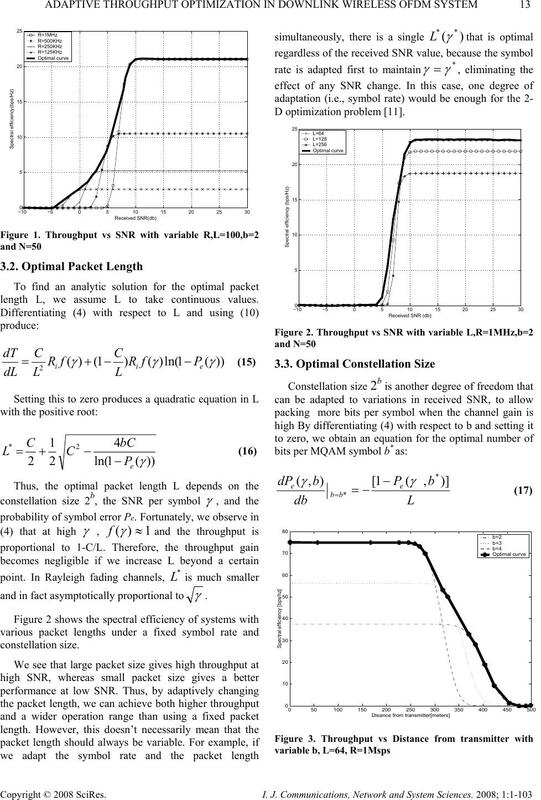 the available bandwidth into N orthogonal sub-channels. community has turned its attention to data transmission. maximized based on the channel model being used. the modulation technique, and the channel conditions. by a single path gain variable. fc is the carrier frequency. 12 Y. FAKHRI ET AL. P the received power in sub-carriers i.
set it to zero to obtain the following condition. length L, we assume L to take continuous values. 14 Y. FAKHRI ET AL. while maintaining the same performance at high distance. error correcting bits and transmit a total of L+B bits. reach an optimum value somewhere around t=20. interference-limited and should be dealt with differently. H. Sampath, S. Talwar, J. Tellado, V. Erceg, and A. Magazine, vol. 40, no. 9, pp. 143-149, 2002. Communications Magazine, pp. 148-161, May 2002.
mobile radio, IEEE Trans. on Commun., vol. 43, pp. 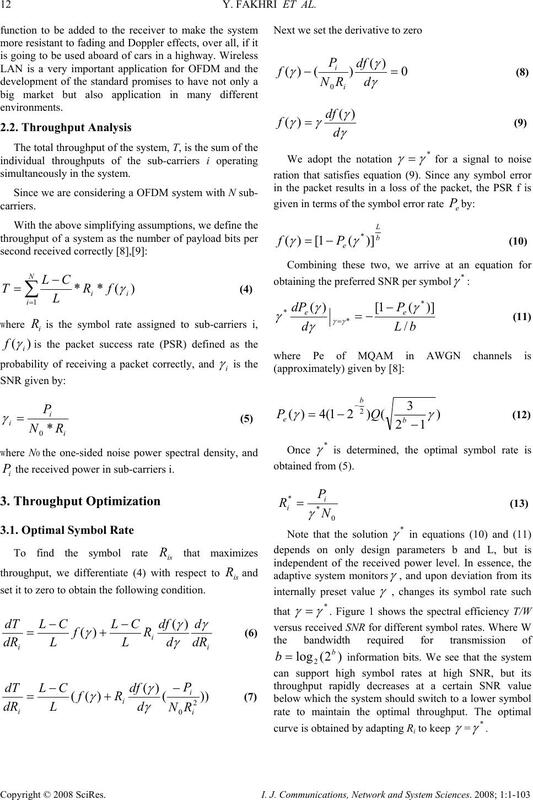 modulation for fading channels, IEEE Trans. Commun., vol. 46, pp. 595-602, May 1998. H. Matsuoka, S. Sampei, N. Morinaga, and Y.
multi-media communication systems, IEICE Trans. Commun., vol. E79-B, pp. 328-334, Mar. 1996. Areas Commun, vol. 18, pp. 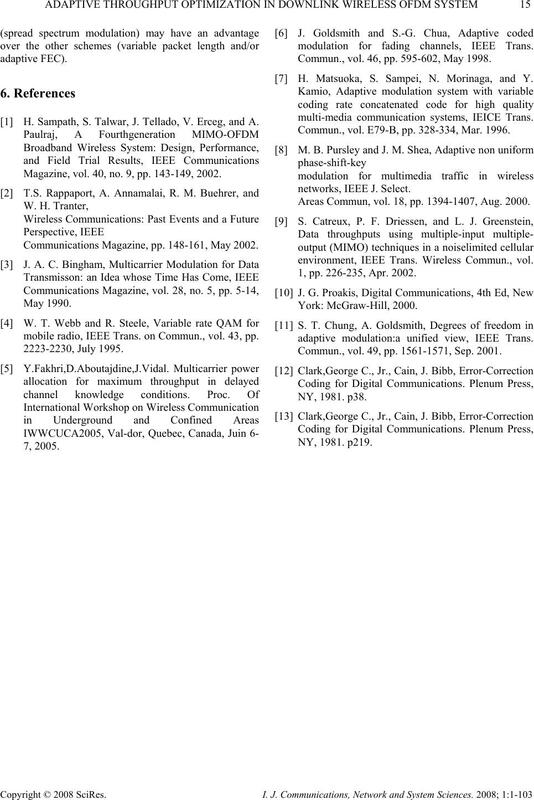 1394-1407, Aug. 2000.
environment, IEEE Trans. Wireless Commun., vol. 1, pp. 226-235, Apr. 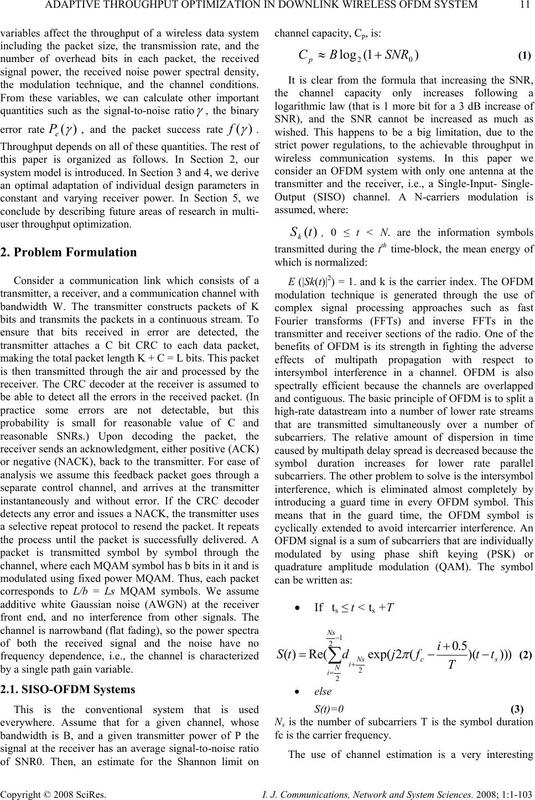 2002.
adaptive modulation:a unified view, IEEE Trans. Commun., vol. 49, pp. 1561-1571, Sep. 2001.